Sure, ranking well in Google leads to more site traffic, long-term readers, and the chance to nurture them into paying customers. But, are you waiting to hit the jackpot? Don’t sit around much longer–it takes more for a blog post to rank in Google than pot luck. There’s a science to it; a set of techniques, ranging from optimized content to clever distribution, that makes it possible. Navigating the path to top rankings is a tricky task to conquer on your own. That’s why we asked over 100 SEO experts to share their best tips for optimizing a blog post for SEO. From thinking twice about your keyword targeting to inserting relevant links, here’s what they said. Search for any “SEO tips”-style post, and I’ll bet keywords make an appearance. Rightly so; they’re the phrases your audience are actively searching for. Why wouldn’t you target them within your blog content to increase your chances of being shown for it? “Having the right keywords in your blog is essential for SEO performance because they are one of the most obvious ways of showing Google how relevant your content actually is to an audience. It will rank you higher in search engine results if it thinks that your content can provide more relevant information to the specific audience who are searching for the term on Google,” explains LeaseFetcher‘s Will Craig. Don’t just dive in with the keywords you think are being searched, though. Do keyword research to find them. Keyword length, difficulty, and search volume… Oh my! Nothing in the world of SEO is easy–you’ll understand that after reading the opinions in this post. Keyword length: Is your keyword 3+ words in length? If so, it’s classed as long-tail. Difficulty score: How difficult is it to rank for this keyword, based on websites already targeting it? Search volume: How many people search for this term every month? “So many people get caught up in trying to optimize/rank for a keyword that has very high search volume and high keyword difficulty, forgetting that long-tail keywords are easier/quicker to rank,” says G2‘s Jordan Wahl. Tools like Ubersuggest, Ahrefs and Answer The Public can help you find the search terms your audience are using. 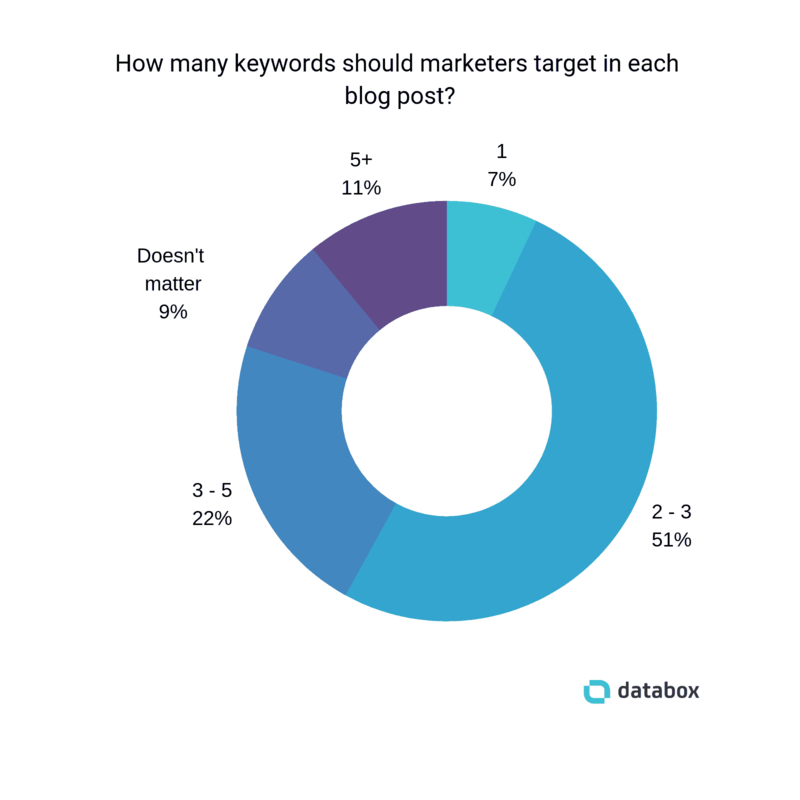 Don’t fall into the trap of targeting a single keyword for each blog post, though. “Using multiple keywords is the most effective way to optimize a blog post for SEO,” says Jennifer Noto of Carolinas IT. Why? Because search engines use latent semantic indexing (LSI), which essentially means they understand when similar words mean the same thing. 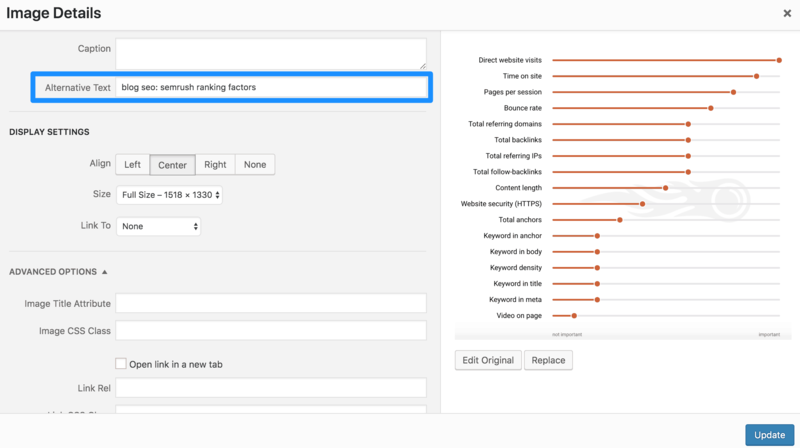 Plus, it using similar keywords throughout your page shows it’s relevant to related queries. But how does this tie-in with blog post optimization? *Editor’s note: Pro tip–another easy way for getting a handle on search intent is by tracking which queries are currently driving the most clicks to your website. 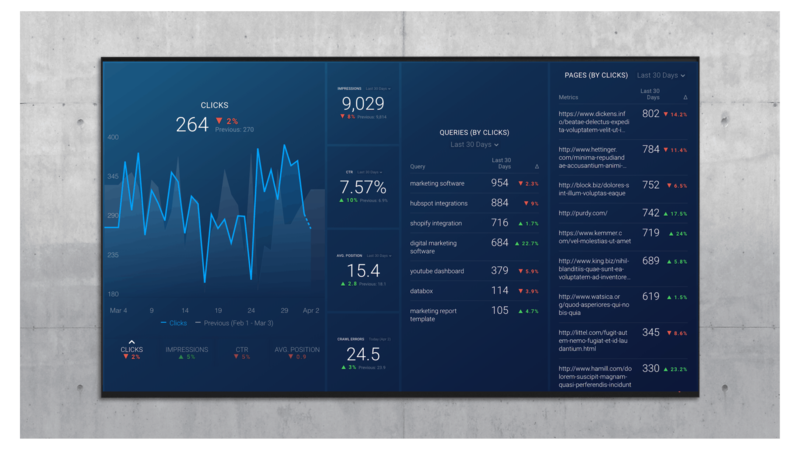 Grab this free Google Search Console dashboard to quick track and visualize yours. “One of our favorite blog optimization techniques is to analyze the search engine results page (SERP) for the keyword(s) you’re targeting with your blog,” shares SuperScript Marketing‘s Anna Wolf. Wolf is not the only SEO expert advising to conduct some competitor research. 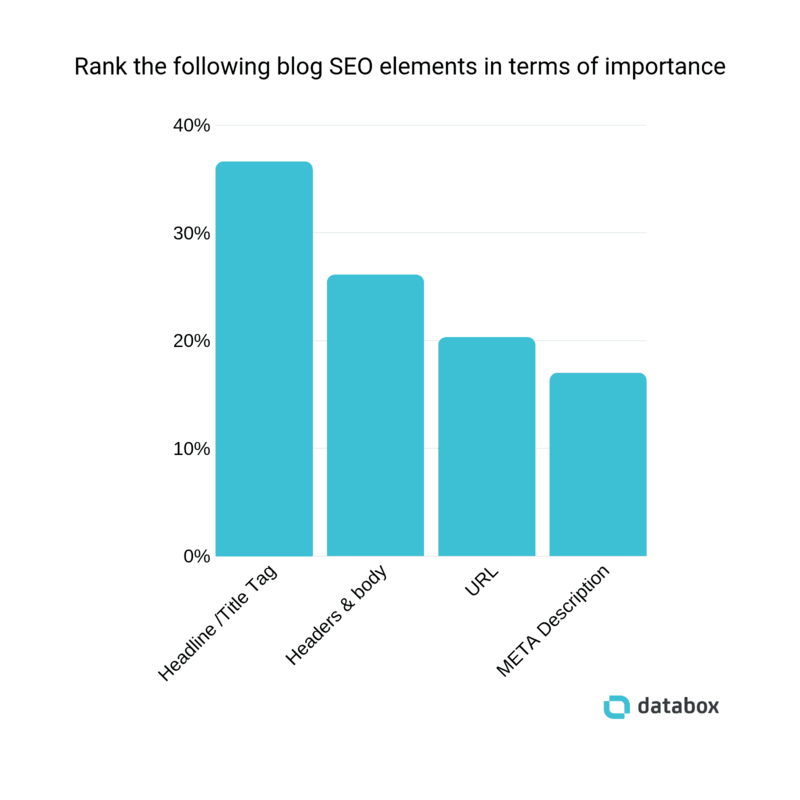 “The meta title is perhaps the most important element in SEO so make sure it includes the targeted keyword yet enticing enough for humans to click on it,” says Jimmy Chan of Pixelicious. Organic click-through rate is known to be one of Google’s ranking factors. Since your meta tags are visible before people click your website, it’s a fantastic way to boost this SEO metric (and your ranking positions, as a result). “Pick a content title, that is catchy and can also deliver reasonable traffic,” says Archideators‘ Muhammad Roohan. Are they using modifiers (such as ‘why do…’ or ‘how to…’)? Where is the keyword positioned in the meta title? What value does the meta description promise if a user clicks through? “Using a free WordPress plugin like Yoast SEO will make editing these elements a breeze,” explains Fundera‘s Nicolas Straut. That’s always a win, right? Don’t fall into the trap of crafting a meta title and description for your blog post before hitting publish, and failing to look at it ever again. Many bloggers fall into the trap of writing a meta title and using the same text as the title of their blog post. The two are different because a blog post title can be any length you wish, whereas a meta description only has 60 characters. That gives you more space to play with, and more opportunity to encourage a click through from social media, a referral website, or your blog’s archive–each of which drives more traffic. So, what makes a great headline? He’s not the only one recommending this SEO technique. “Insert high volume keywords where necessary but not too much where reading the article seems unnatural,” says Jason Martinez of Redefine Marketing Group. Including the keyword towards the top of your blog post “will have a huge impact on users and search engines indexing the content provided in your blog and help you list higher on the web,” summarizes Andrew Ruditser of MAXBURST, Inc.
It’s easy to fall into the trap of writing for Google spiders. A keyword here and an optimized headline there–it’s all written for Google, right? You’re trying to drive people to your website. 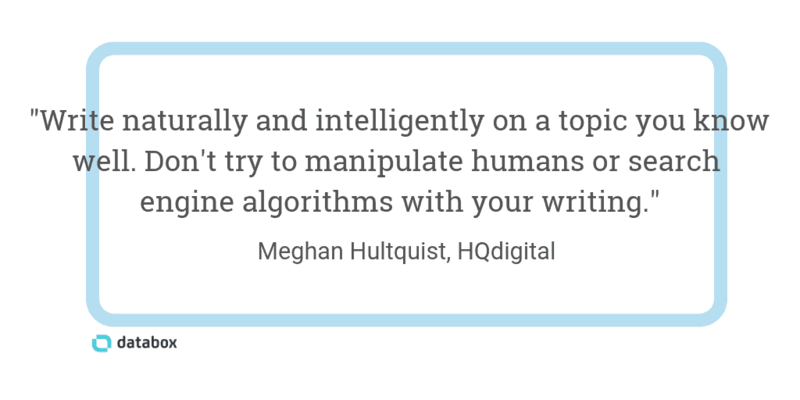 Why wouldn’t you write content for them, rather than a robotic search engine? 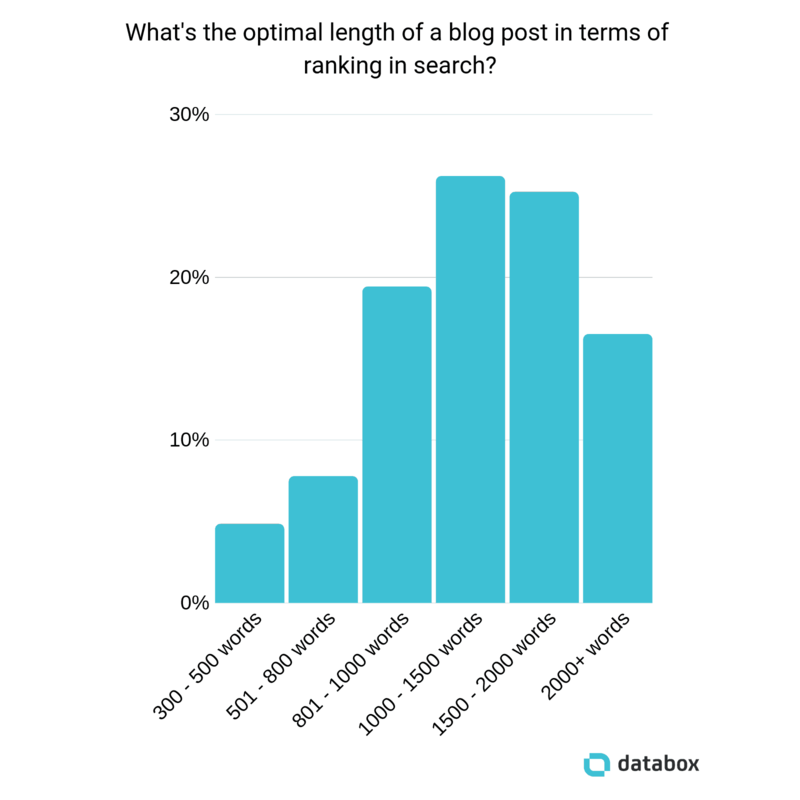 “No matter how hard you try to rank a blog post, if you write it for the search engines and to get it to rank only, it’s likely to never get read or have the effect you want it to have,” says Exprance‘s Nick Leffler. Chances are, any “guide to SEO” will tell you that long-form is the best type of content to create. So, is it ever worth going long-form? The short answer is “yes”–so long as your audience is willing to invest time into reading what you have to say. “Understand why you are creating a said piece of content, then ensure that the blog covers every aspect of that specific topic with relation to your why, leaving no room for questions,” says Anish Padmanabhan of Auspin Digital. Studies have repeatedly shown that long-form content takes the top spots in search. To put this into practice, “make sure you have the proper length and fully answer or explain the topic you are covering,” says 9Sail‘s Bryan Pattman. “Your ability to keep a reader’s attention when they find your article defines whether our content will succeed or fail,” says Pat Ahern of Junto. “Use the squint test to scan the page to identify design and layout flaws so that you can adjust the layout to make it more readable. Don’t bring your readers to a page with a wall of text, or they will leave just as fast as they came. This will ultimately erode your search visibility as Google measures site interaction as a signal for rankings,” advises Jumpfactor‘s CEO Zamir Javer. 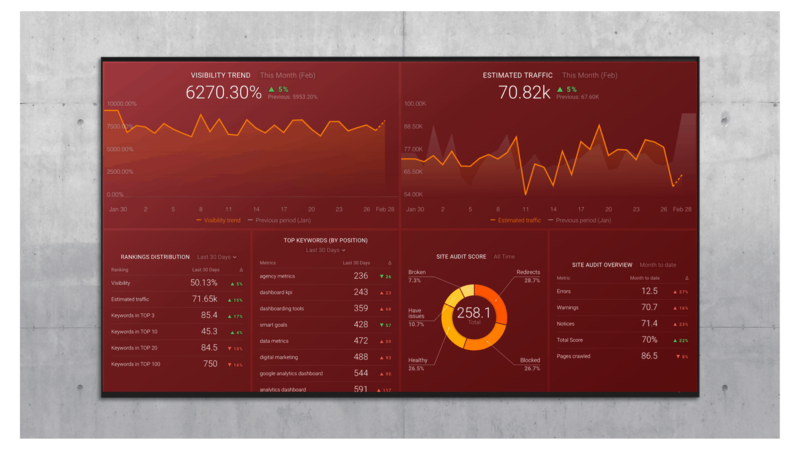 *Editor’s note: SEMrush users can download this free template and track their highest-ranking keywords, ensure all links are still working, and much more. Did you know that 87% of smartphone users use search engines at least once a day? Ever use heading tags to style your blog posts? 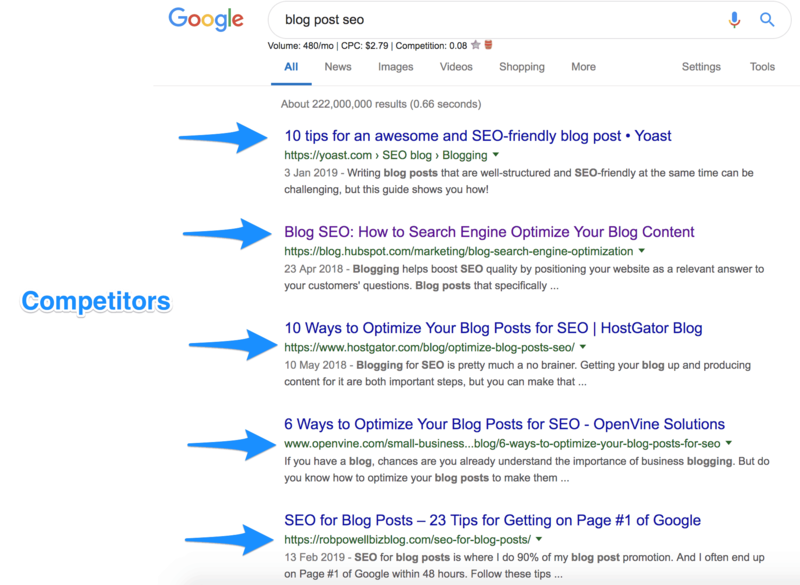 Along with making content easier to read, heading tags are used by Google spiders to determine what your blog post is talking about–and therefore, rank for. 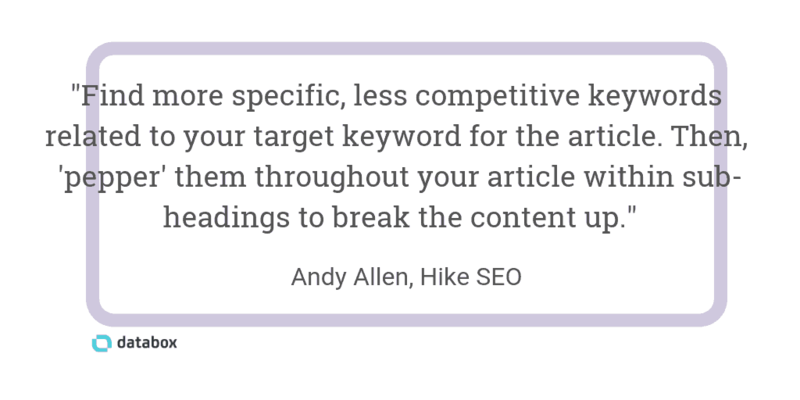 “If you can find more specific, less competitive keywords related to your target keyword for the article, then ‘pepper’ them throughout your article within sub-headings to break the content up (and make sure the sub-headings are formatted at H2’s),” shares Andy Allen from Hike. We’ve already talked about how on-site factors–such as dwell time and time on page–affect your rankings. Let’s dive a little deeper into the formatting of your blog post. Remember how readability was one of our experts’ tips? “If it’s a long form post, you’ll improve UX by including an image or video every 125-200 words to break up the text and improve visitor dwell time,” explains Jason Thibault of Massive Kontent. Search Engine Land recently declared image SEO as being “back from the dead,” with websites experiencing a 37% increase in clicks from Google image search, on average. 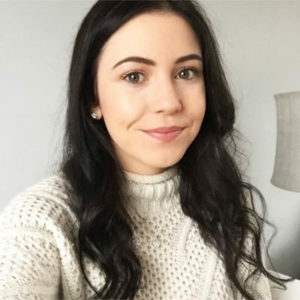 But for your blog posts to reach the top spots in the image search, Ana Cvetkovic of BLOOM Digital Marketing thinks you need to create a descriptive alt text for the images you’re uploading. Orbit Media put this to the test with their internal linking experiment. After editing older content to include internal links, rankings increased almost immediately. 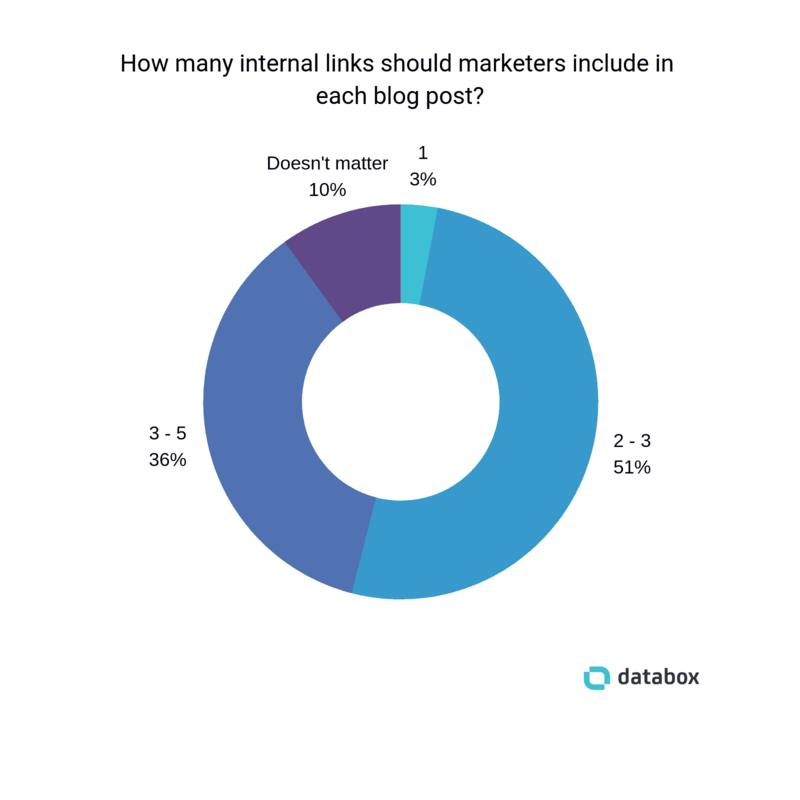 However, the number of internal links you should include in a blog post has been a longstanding debate. But regardless of how many you’re sprinkling throughout your blog post, these marketers still agree that it’s an easy optimization trick. “If you launch a brand new blog post, one of the easiest ways to immediately improve the SEO of that post is to find other relevant posts on your site which you can link to your new post. This is especially effective if the posts you’re adding the links to have external links themselves or are getting traffic,” says Sam Williamson of ATYNTK Movie Streaming. 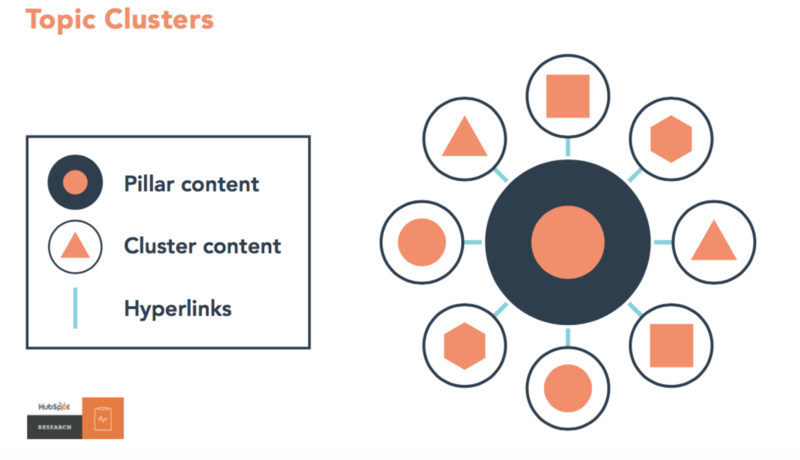 The pillar and cluster model is a content strategy created by HubSpot. It works by creating blog post acting as an overview of a specific topic, with “clusters” linking from the page that dive into detail with each sub-section. It’s not just a range of blog posts you’ll create using this strategy, though. Gray Group International‘s Alejandra Melara thinks this strategy is a great way to improve your blog’s SEO. External links help give a nod to related content out in the industry,” writes Seventh Scout‘s Vira Vielmann. It makes sense: Google wants to direct their users in the way of high-quality content. If other people have linked to your website, you must be sharing something good. …and tell them about it! Have you linked to other authoritative websites in your industry? “You want to try to perform outreach to people or organizations mentioned in the post and get in touch with influencers who may be interested in the topic at hand so that you increase your chances that other websites will link to it,” shares Jim Milan of Auto Accessories Garage. It’s a type of influencer marketing bound to skyrocket your blog’s SEO. The text you’re adding links to is called anchor text. It’s a good idea to have a mix of all four. Therefore, Google won’t assume you’re doing any dodgy (or spammy) link building, and land a penalty on your website. “Site-speed is one of the most important factors of a successful SEO campaign as search engines crawl web pages at increasing rates,” says Maple Holistics’ Nate Masterson. It goes without saying that you want to make your blog posts load as quickly as possible. SCHEMA markup is a technique website owners can use to convince Google to show more detail in the SERPs. That’s what we’re aiming for, right? “Before you hit “Publish,” figure out your distribution plan,” explains Jon Barilone of Tripepi Smith. A distribution plan simply means the schedule you’re using to promote your content. A study by RankXL concluded there’s a slim chance of ranking in Google without backlinks. But you can’t get any backlinks if there’s nobody around to read your content–which is why a content distribution plan is crucial for SEO success. 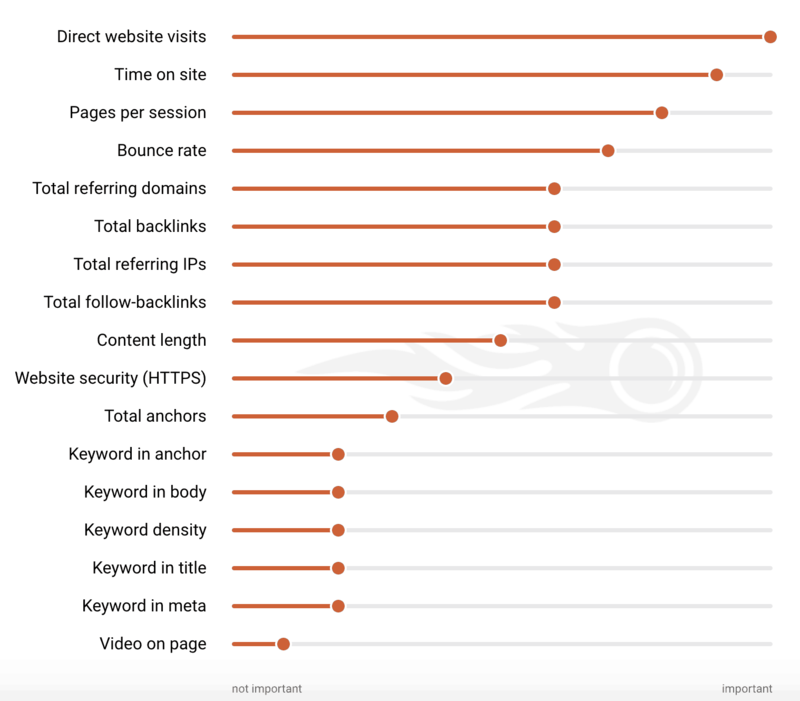 “Chances are you have some older content that forms the backbone of your site’s traffic,” explains Dennis from core dna. 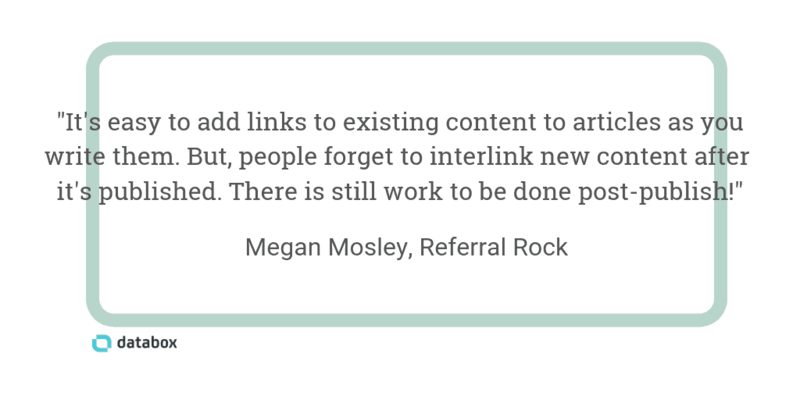 Referral Rock‘s Megan Mosley recommends this SEO tip, too. Ready to put your feet up and watch the rankings roll in? Your job isn’t finished yet. “The real work starts after you’ve hit the publish button,” says RunRepeat‘s Sadi Khan. So, how do you build strong backlinks to your blog posts? Black hat SEO tactics like paid guest blogging, or writing for Private Blog Networks (PBNs) aren’t successful anymore. Finally, “leverage your relationships, reputation, and quality of your content to get people to share and link to your blog,” writes Josh Paul of Small Marketing Teams. It seems like after all, it’s relationships with people that improve your blog SEO–not your relationships with Google spiders.